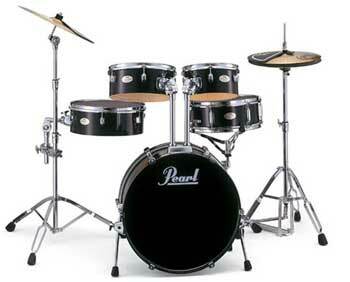 As you can see above, I’m now the proud owner of a super-shiny and compact Gretsch drumkit for gigs. And it’s a lovely thing! 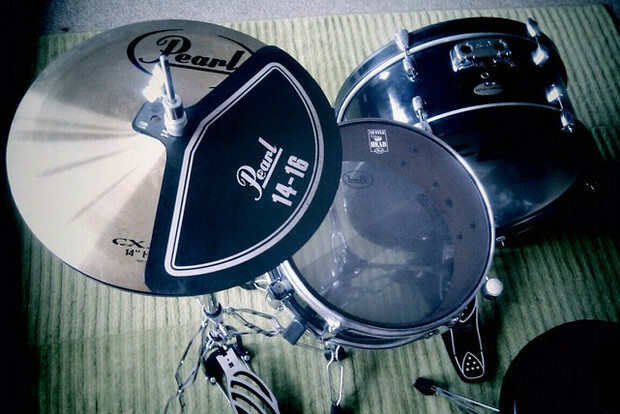 So what happened to the Pearl kit? 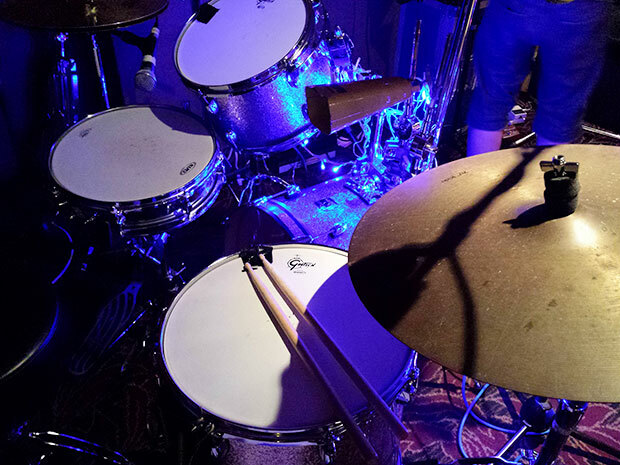 I haven’t got rid of the original Pearl kit that was doubling up as both a live and a practice kit – it’s now sitting at home and still being used regularly. 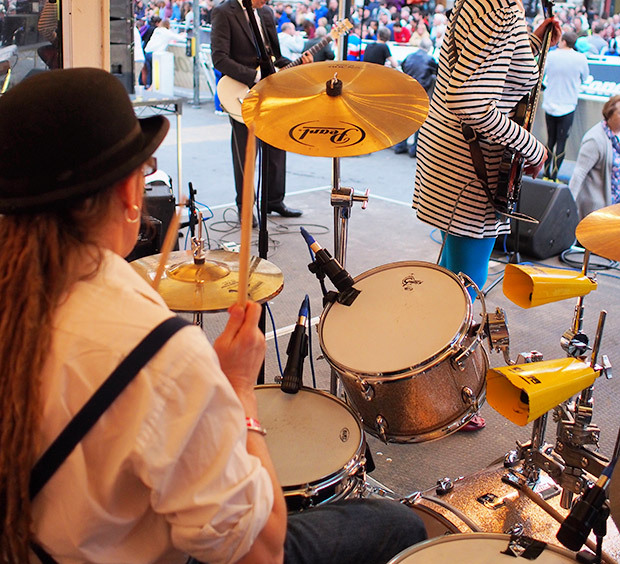 Although it sounded fine as a live kit, it became a bigger and bigger pain in the arse to keep swapping the heads over for every gig – especially as my band was picking up more shows. Perhaps it was the fact that it was so quiet that led to its downfall: when the mesh heads were fitted it was possible to have full band practices around the house, which meant that we spent less time in rehearsal studios. As a result, the heads on the kit were constantly being swapped over and that became a real chore, so I started looking for a kit that I would use exclusively for live work. I spent some time scouring the internet and flicking through brochures trying to find the ideal kit – which meant trying to find something that wasn’t going to break the bank, but was compact and with a great sound. I tend to bash drums pretty hard, so I needed a set up that was going to be sturdy enough to take a hammering, and I didn’t want the toms to be so tiny that I’m going to need a laser sight to hit them. 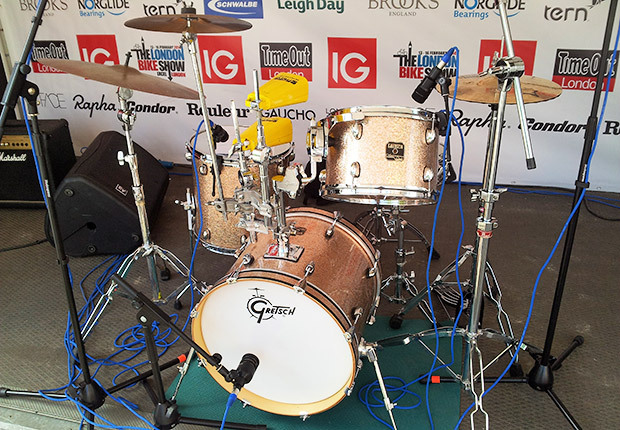 In then end, I settled for the Gretsch CC-J484-COS Catalina Jazz kit but have a confession to make: what really won me over wasn’t the tech specs, but the finish. It’s sparkly! Shiny! And pleasingly old school too. 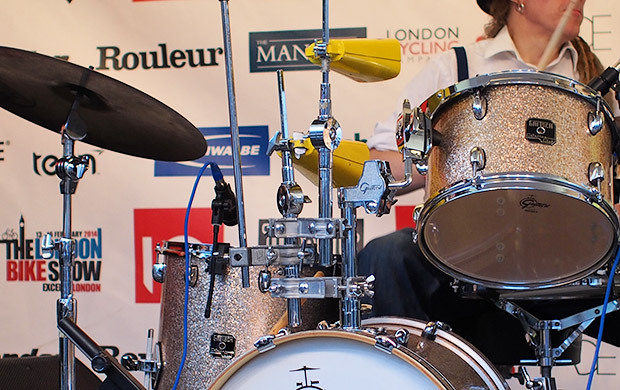 I bought the kit from my favourite local drum store, Drumshack in south London, with the four drums (12×8″ Tom, 14×14″ Floor Tom, 18×14″ Bass Drum and 14×5.5″ wood Snare Drum) priced at a discount £419. 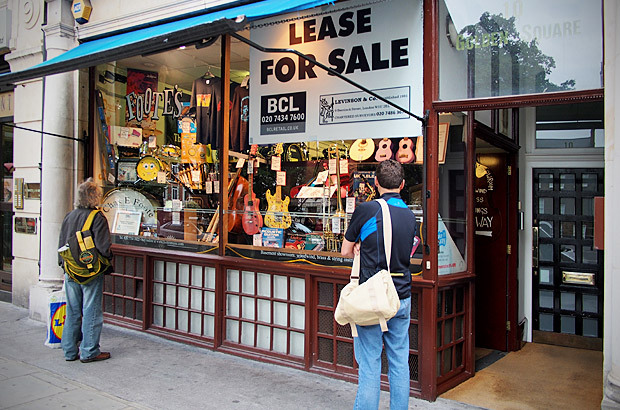 Note that this price just buys you the shells, skins, tom fittings, BD riser and no other hardware. 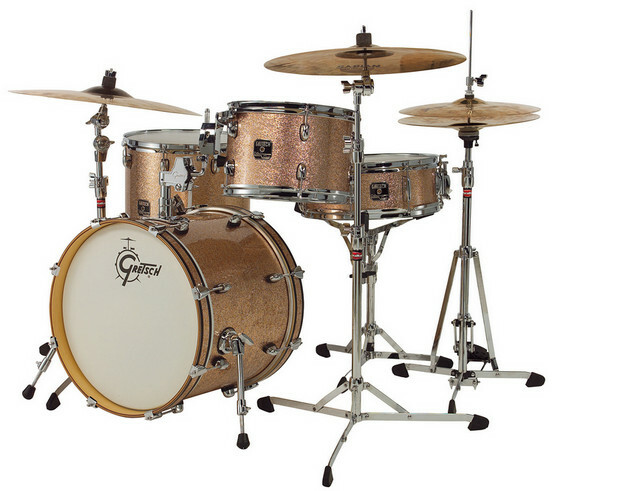 The mahogany shells and 30-degree bearing edges give the kit a well-rounded, warm, round, classic tone and with the kit coming with a decent set of skins, it didn’t take a lot of tweaking to get a good sound out of it. The snare (which I bought as a back up) isn’t quite so impressive, but that’s very much down to personal taste. I like my snare drums to have a bit of a sting and attack to them, and that’s something I’m unlikely to get with an all-wood snare. The Gretsch hanging tom fitting took some getting used to though – I found it a lot more fiddly to set up than the no-nonsense Pearl fittings, although it could be argued that hanging tom fittings produce a cleaner sound. The set up I use involves adding a couple of cowbells and I haven’t really nailed the best way to do this (as you can see from the rather precarious multi clamp arrangement above!). Of more concern was the bass drum pedal arrangement. With the bass drum being so small, it has to be lifted up a couple of inches to endure that the BD beater hits the skin at the right angle. The kit came with a Gibraltar BD lifter but I had terrible problems with this as it was nigh-on impossible to position it close enough to the bass drum. Because my old and rather cheapo Pearl and Yamaha BD pedals were fastened by a screw that sat underneath the footplate, the pedal kept hitting the metal, and as a result quickly proved unstable. I didn’t very much enjoy my first gig with this rather wobbly combination, so ordered a Mapex bass drum lift, which seemed more flexible. Despite the increased adjustment options offered by the Mapex gizmo, I still had trouble with the footplate hitting the fastener screw. 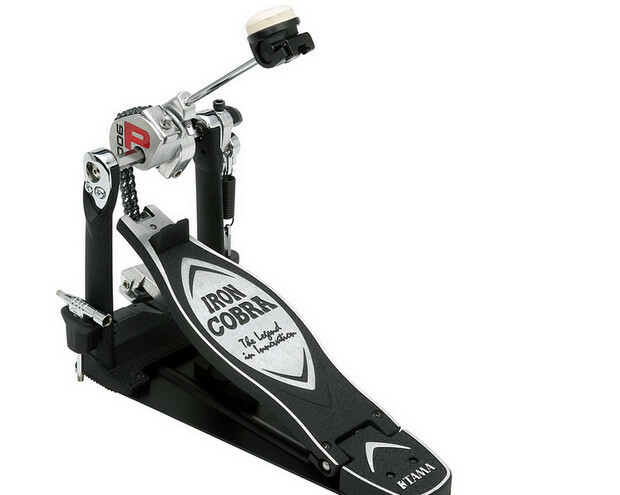 Figuring it was time I invested in a decent BD pedal anyway, I bit the bullet and forked out £120 for the Tama Iron Cobra HP900PS Bass Drum Pedal . 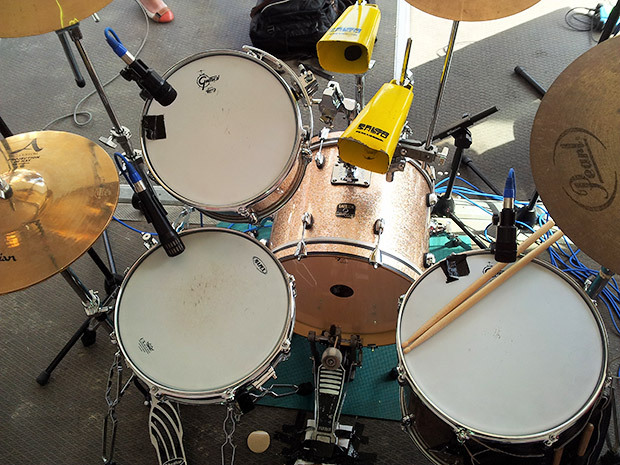 Happily, this combination seems to work a treat, so I didn’t have to keep looking down at my bass drum for the last two gigs – everything seems very solid. 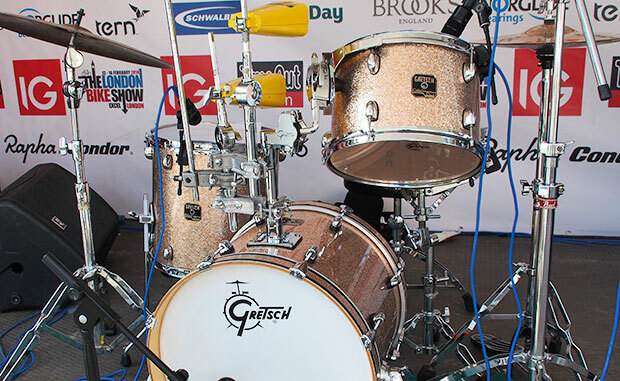 If you’re looking for a great-sounding compact drum kit with fantastic looks, I can’t recommend the Gretsch enough. 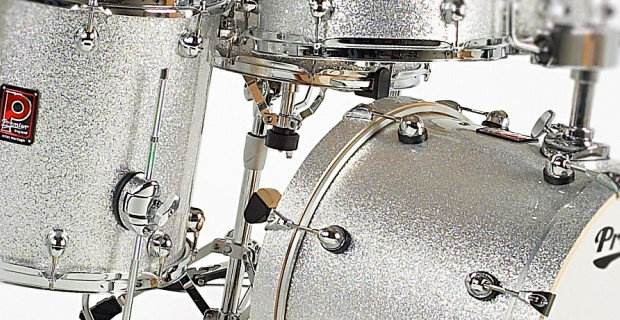 Although the floating tom fitting isn’t as intuitive to set up as other makes, and depending on what bass drum pedal you’re using, you may end up having to invest in another BD lifter, these are easily fixed problems. Small enough to pack in the back of a cab and tough enough to take on the road, this is a great kit that comes with the advantage of show stopping looks. I love it! 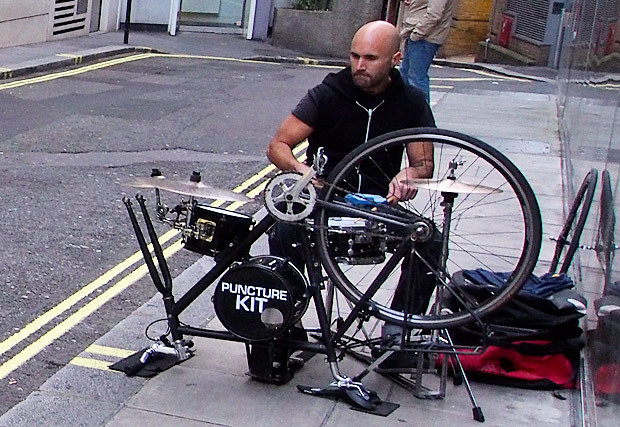 More: Building and buying an extra small, super-portable drum kit for gigging drummers.